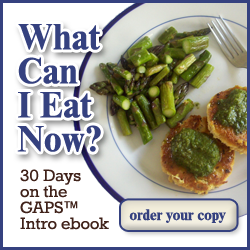 GAPS Intro Stage 6 is the last stage of intro before you head into the full GAPS diet. Make sure the apple is ripe, and eat it peeled. Gradually introduce other raw fruits, avoiding citrus. You can use the nut bread recipe from Stage 4 and add fruit to it, or read the Internal Bliss cookbook or recipes from the GAPS book for more inspiration. Be careful not to buy dried fruit that has any added ingredients. We prefer to buy organic produce from a local farmer when it is in season, then dehydrate it ourselves. This saves a lot of money and guarantees a safe end product. Make sure to continue eating foods from the previous stages, especially soups made from stock! Once there are no longer major symptoms, it’s time to move onto the Full GAPS Diet. How long it takes to get through the Intro diet will depend on the person. P.S. – OK, I’m realizing now I should have been calling this “simple,” not “easy.” Basically, the foods you eat are simple. The list of what to eat isn’t long or complicated. Yes, there is prep work and planning involved. Any time people eat real food that doesn’t come from a box, there is prep work and planning! Can you ever eat apple peels again? Apples including the peel are allowed on the full diet. Just make sure they haven’t been treated with anything scary! thanks for you post, joy. my 5 year old spent about 3 months on the intro diet and has moved on to the full gaps diet, except for raw apple. he does not seem to be gaining a tolerance for it either. is it possible he just can’t ever have it and we should move on (begin counting the 6 months of normal digestion)? It’s possible he’s not ready for apple, and it’s also possible that he won’t be able to eat it. The type of reaction he has makes a difference as well. If he has digestive trouble with apples, I would take a look at FODMAPS and see if he tends to react to other foods with FODMAPS as well. If everything else he’s had on GAPS so far is well tolerated, just not apples, I would probably hold off on the apples and let him try more of the other foods. Our family has found that we don’t all become ready for the same foods at the same time.